The Los Angeles Department of Water and Power has decided to follow its neighboring utilities in deploying grid-scale batteries. Today, LADWP finalized its partnership with Doosan GridTech and KTY Engineering to deliver on its first battery energy storage system. 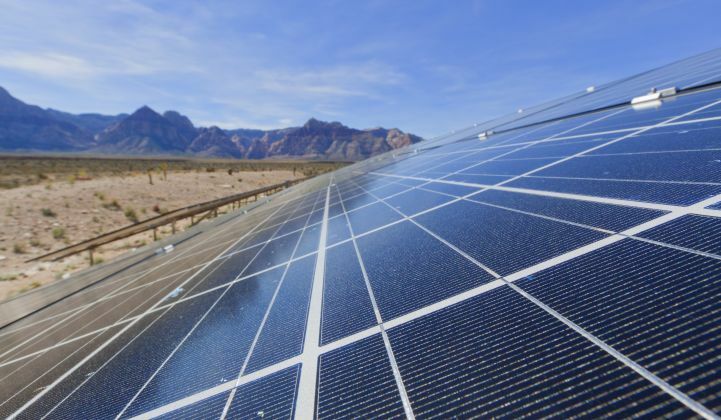 The utility recently approved procurement of a 20-megawatt/10-megawatt-hour lithium-ion system to go into the Beacon Solar Plant in the Mojave Desert. The system will increase utilization of the desert's solar generation, as well as provide grid reliability service in the wake of the Aliso Canyon natural gas disruption, which prompted LADWP to accelerate delivery from 2020 to March 2018. LADWP has an impressive grid storage capacity of 1,296 megawatts, but that's almost entirely from the Castaic pumped hydro storage facility. To install its first battery system, LADWP turned to Doosan GridTech, formerly known as 1Energy Systems* before the acquisition by the South Korean conglomerate Doosan Heavy Industries in July 2016. This marks several firsts for the company, said Vice President of Product Management Rogers Weed. It's the first major contract since the integration with Doosan, the first project in California for the Seattle-based company and the first time GridTech has provided turnkey EPC services on a project, flexing the financial muscle that comes with a large corporate backer. Previously, 1Energy had involved utility partners in some of the development and procurement work. Many know Doosan GridTech as a software specialist, and software to manage storage systems and fleets of distributed resources remains a core expertise of the firm. But there's not a ton of money in standalone storage software yet, because few customers have enough battery systems linked together to justify buying fleetwide management tools. Good, old-fashioned project execution, though, can turn a profit in the meantime. This move from a storage software focus into heavier development work mirrors similar shifts at Greensmith and Demand Energy over the past year, said Brett Simon, energy storage analyst at GTM Research. The backing of large multinationals (Greensmith was acquired by Wartsila, Demand Energy by Enel) helps these startups compete at multiple steps of the value chain, which can lead to more project wins. "Concentrating purely on one aspect of the value chain can be a risk in today's market, as the energy storage space is still maturing," Simon said. "Companies able to demonstrate value in multiple areas can offer additional value to potential customers, while simultaneously possessing the agility to address a variety of market opportunities." That doesn't mean that the remaining pure-play software companies are doomed. They just have to face a challenging market without an alternative revenue stream for potential dry months before the storage market reaches greater scale. *A previous version of this story misspelled the former name of the company. It has been corrected.